Strong Memorial Hospital offers care in 40 different specialties and is ranked as one of "America's Best Hospitals" by U.S. News & World Report, and has won the Consumer Choice Award for the best hospital in the area for 12 consecutive years. Strong has signature programs in cardiac care, cancer care, neurology, orthopedics and pediatrics. As an affiliated academic research hospital, patients have access to the latest treatments before they are widely available elsewhere. Part of the University of Rochester Medical Center complex (abbreviated URMC), the hospital is a major provider of both in-patient and out-patient medical services. 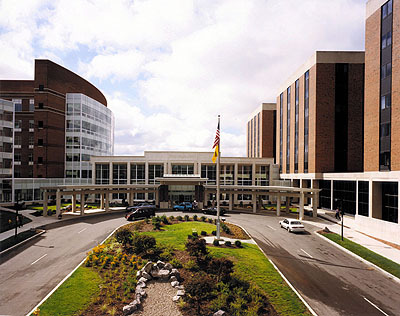 Strong Memorial Hospital (abbreviated SMH) is the biggest jewel in the crown of the University of Rochester Medical Center system. SMH is composed of a series of attached buildings. The different sections of the facility range from 3 to 11 floors, although not all areas are accessible to the public. The hospital offers 750 patient beds. Strong provides emergency medical services. Patients and visitors may navigate the facility by following colored ceiling tags to the appropriate elevators: red and green for inpatient services; silver and orange for outpatient services; and blue for inpatient psychiatric services. The latter, commonly referred to as "R-Wing," is non-contiguous with the rest of the hospital. Note that letters appear on one side of the ceiling tags. When you see the letters, you are walking towards the elevator bank of that color. The unlettered reverse side indicates that you are walking away. Cafe 601, located near the red elevators on the first floor, is the major cafeteria for visitors, although those with a bent for exploring may find other fare at Au Bon Pain or West Winds, although the latter two have far more restrictive hours, offer a more limited selection and cost more. Finger Lakes Coffee Roasters maintains two carts in and around the lobby on the first floor (not to be confused with Ground!). They also serve baked goods from Genesee Bakery & Deli. 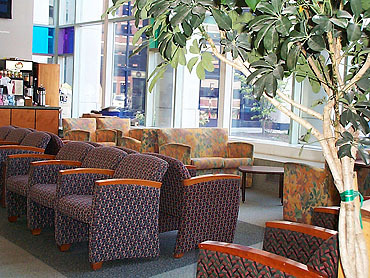 Friends of Strong maintains a reception/information desk, a "specialty shop" and a comfortable waiting room on the first floor, all near the lobby. An outpatient pharmacy is off of the lobby, (Hint: University of Rochester employees get a steep discount on OTC drugs like ibuprofen), just around the corner from the Friends of Strong gift shop. SMH is a teaching hospital and patients may expect to interact with faculty, residents, fellows, interns and/or medical students. Astute visitors may also notice signs for clinical research trials, which can be a handy way to earn a little extra cash and do good at the same time. The Emergency Department is directly accessible from Elmwood Ave; within the hospital, take the red elevators to the ground floor. The parking garage may be accessed via Elmwood Ave or East Drive, which runs between Elmwood Ave and Crittenden Boulevard. R-Wing visitors should not park in the garage, but should aim for the Visitor Lot on the far side of Crittenden Blvd. RGRTA provides bus service to the traffic circle on the Crittenden Blvd side of the lobby. Taxis and medical transport services also use this circle. Valet parking is available, for fee, on the Elmwood Ave side. Between 1945 and 1947 non-consensual human experimentations were conducted for the Manhattan Project at Strong Memorial Hospital. In 2006, Ronald McDonald House opened in Golisano Children's Hospital, which is accessible via the red elevators. As of April 2007, the entire Medical Center complex, which includes the hospital, parking garage and parking lots, is smoke free. Staff has been instructed to direct smokers to the sidewalks off of the campus if they wish to smoke. You may not smoke inside your vehicle either. Adjacent to the hospital is the out-patient Ambulatory Care Facility (ACF) tower as well as the James P. Wilmot Cancer Center.